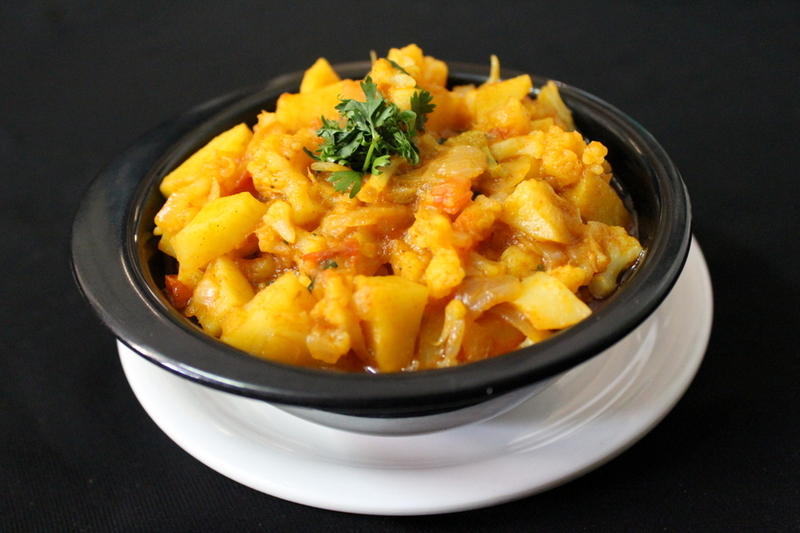 aloo gobhi ki sabzi is a mixed veg curry made using the combinations of potatoes and cauliflower. It is a good side dish that is suitable to be eaten with roti or poori. It is also an amazing combination with rice. This is a mixed veg curry that can be eaten with both roti and rice. I have already posted some of the sabzi recipes like cauliflower sabzi, aloo sabzi, brinjal curry, palak sabzi, aloo palak, potato curry etc that are good vegetable side dishes. I have used here commonly available vegetables in winter season that is gobi and aloo and these veggies are available everywhere across India. 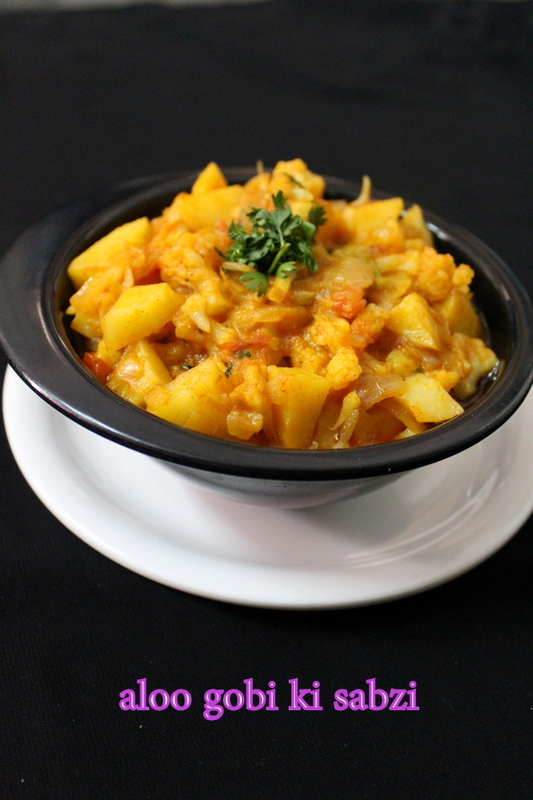 This aloo gobi ki sabzi is a curry which is made in different ways across different regions. If it is made in South India then, the vegetable sabzi is given tempering initially and the curry is cooked. In northern india, basically, the tempering is not given and directly the curry is made using onions, tomatoes and spices. Here I have made without giving any tempering initially and I have just used onions, tomatoes, spices and the veggies to make aloo gobhi ki sabji. There are various side dishes that can be eaten with both roti and rice and and this is one sabzi recipe that can be eaten with both. Similarly, there are other side dishes too are perfect to be eaten with rice too and shall be posting as I keep posting various recipes. Before using cauliflower make sure to cut them into medium size florets, blanch the florets in water well inorder to remove any small particles that are stuck inside and strain the florets. Following this method helps in removing any unwanted things that appear inside the gobi. Below is the recipe for aloo gobhi ki sabzi made like a curry and do try this delicious recipe and hope my blog readers will love making it and serving their loved one’s. A simple vegetable side dish made using potatoes and cauliflower. Take a pressure cooker, into it add oil and heat it. Add chopped green chillies, chopped onions and cook until they turn soft. Add chopped tomatoes, add salt as per taste, red chilli powder, turmeric powder, coriander seeds powder, cumin seeds powder and mix well. Cook the gravy well for few minutes until oil starts leaving the sides. Add the potatoes and cauliflower florets, mix well. Cook the veggies for few minutes(approx...5-6 minutes). Add water and give a mix. Pressure cook the aloo gobi ki sabji until they turn soft(approx... 2-3 whistles on high flame). Reduce the steam, remove the lid, add some freshly chopped coriander leaves. Cook the sabzi for few minutes on low flame and its done. Serve hot with phulka, chapati or rice. 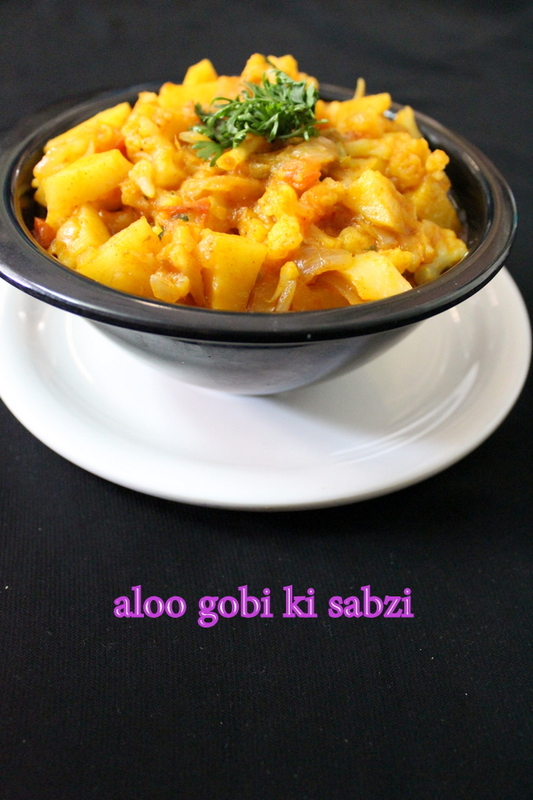 If one does not prefer to use a cooker, then this aloo gobi sabzi can be made in a cooking vessel too. 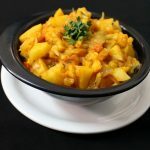 If one prefers to make it just like a dry sabzi then we can even skip adding tomatoes and continue making the curry following the recipe directions.